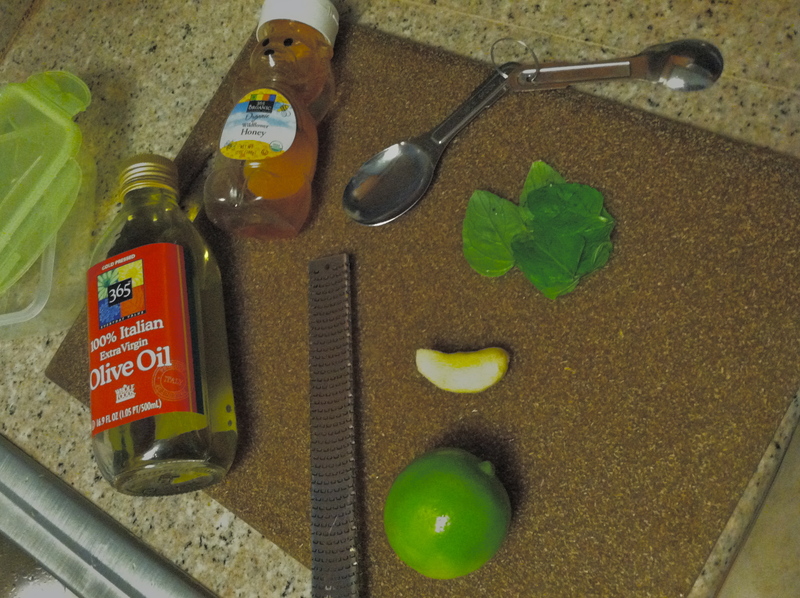 Hami Melon & Recipe | Keep It Up, David! 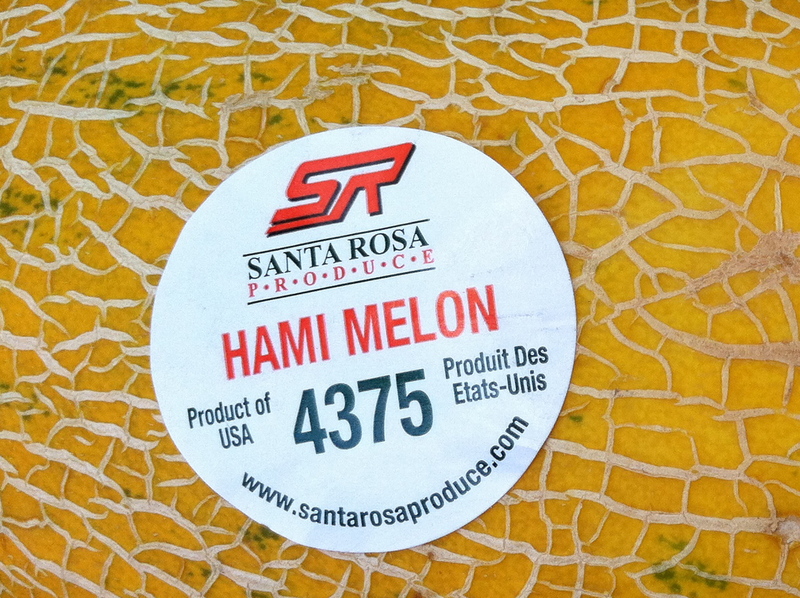 My most recent produce haul post featured a quick mention of my purchase of a hami melon, a variety of melon that I hadn’t heard of before. It’s a good lookin’ melon, don’t you think? Hami melons are named after the Chinese region where they were cultivated, in the northwest part of the country, near the Mongolia border. 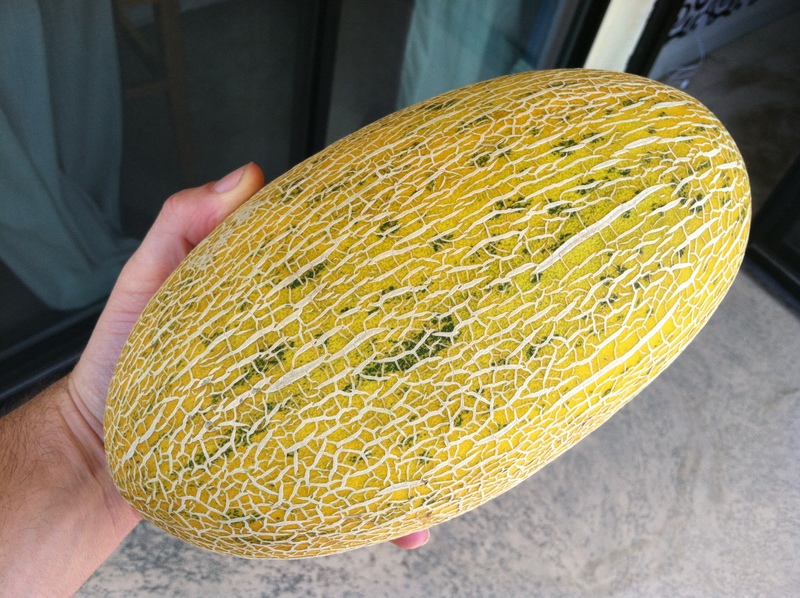 There are actually about 180 varieties of hami melons, but the ones grown in the Unites States, like this one was, tend to be oval-shaped and flecked with green. 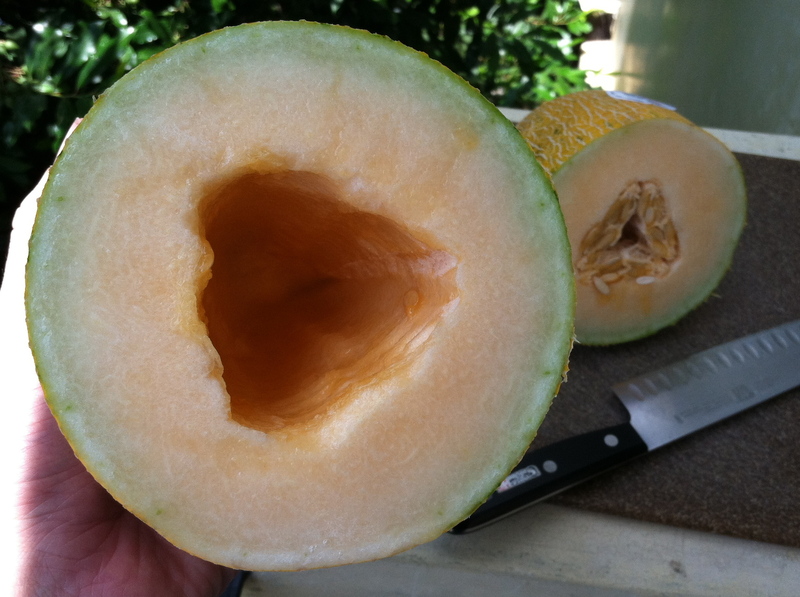 Cut one open, and you’ll find the flesh is paler than that of a cantaloupe, but the texture and density is similar. 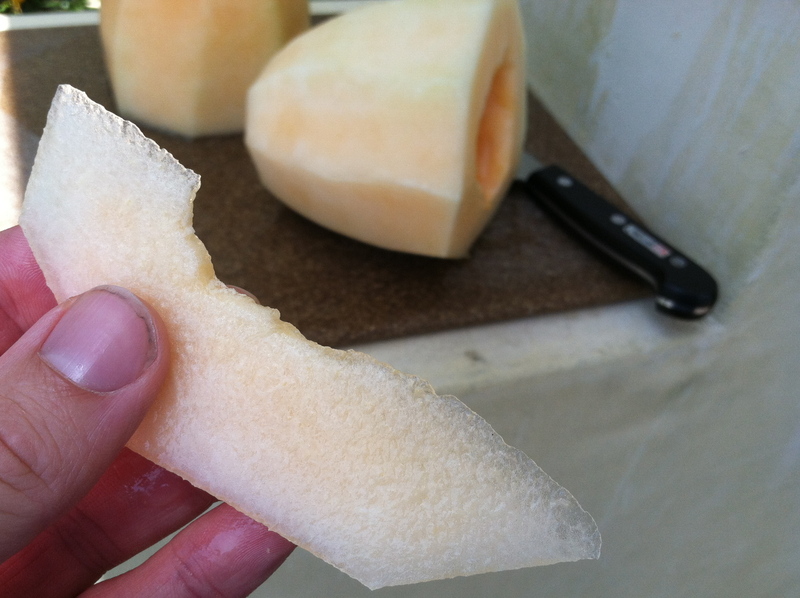 After scooping the seeds from the center cavity, I placed each half on my board, and cut down the sides, which is the quickest way to separate flesh from rind. I was going to use my hami melon in a recipe, but I had to sneak a piece to try. Delicious. It was crisp and sweet, and pretty juicy, too. It’s a little milder than a cantaloupe. 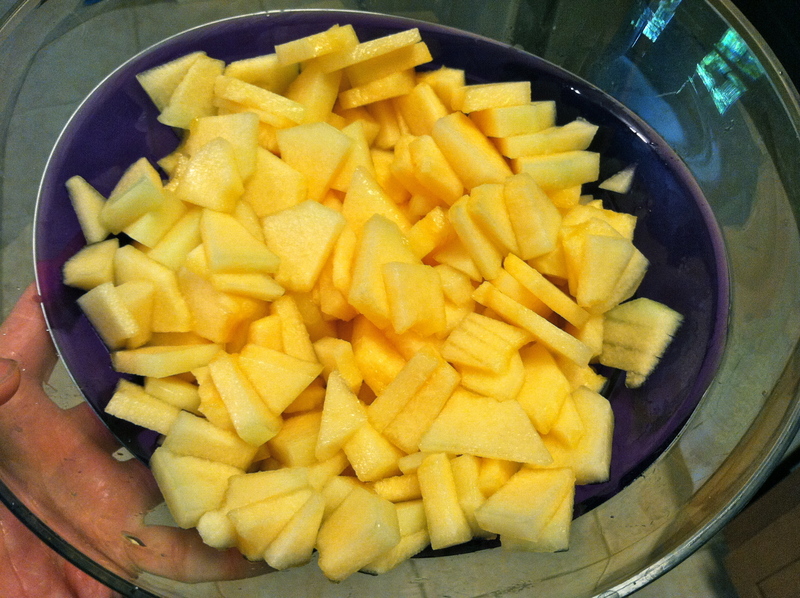 This recipe is based on a cantaloupe recipe I found online called Sunshine Salad. I found it here. But I made a lot of changes, as I like to do, starting with the title, because Sunshine Salad is pretty lame. I hear Sunshine Salad, and my mind goes to ambrosia, complete with canned fruit and mini marshmallows. Your mind might go someplace else completely, and that’s my point: Sunshine Salad doesn’t describe the dish at all, and doesn’t mean anything. It’s dumb. So I’m going with the completely practical and entirely uncreative Hami and Cucumber Salad. Next step: cucumber (duh). 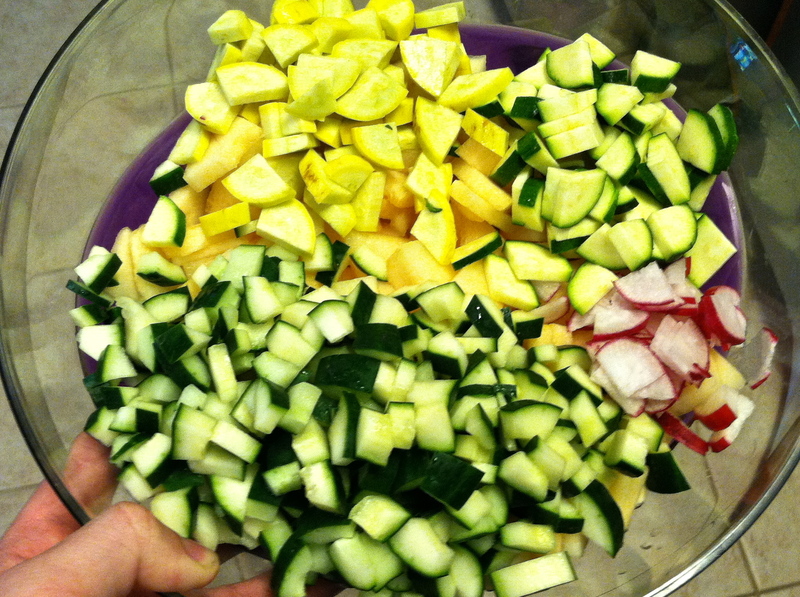 I added 1 and 1/3 cucumbers, deseeded and chopped (I had 1/3 of a cucumber lying around that I wanted to use up). 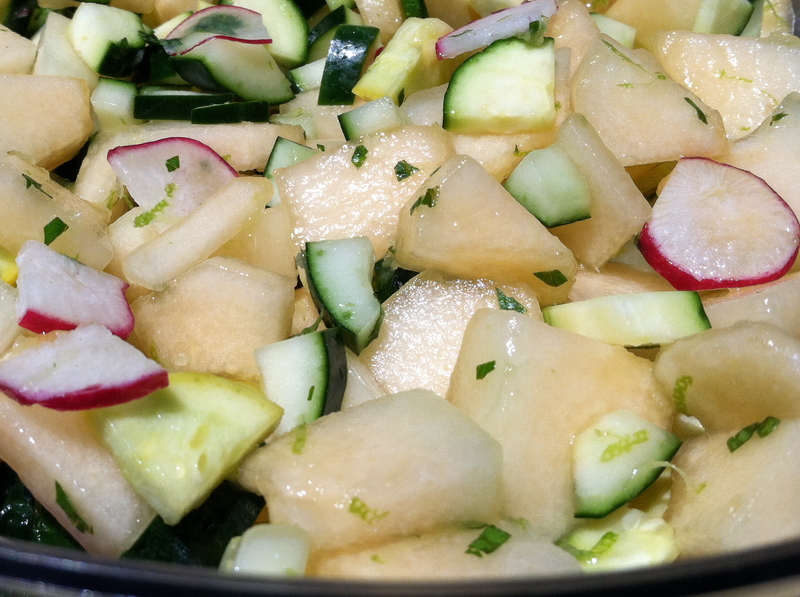 Then, to bulk up the vegetables, I also added one singular radish (my last radish, also lying around), which I sliced as thinly as possible, along with 1 small zucchini and 1 small yellow squash. The Sunshine Salad recipe called for clementine sections, but clementines aren’t in season right now, so screw it. 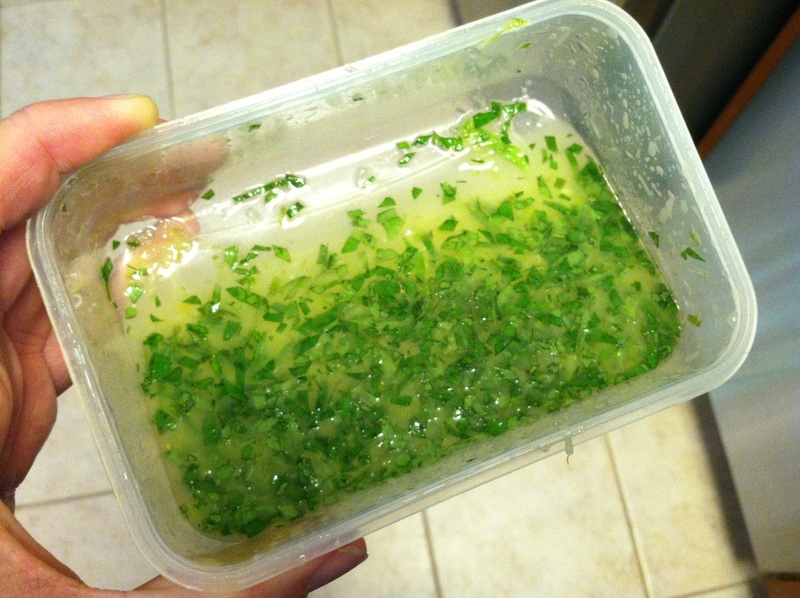 I dumped it all in a little tupperware container, and added about 1 tbsp of water, to thin it out a little. Then the lid went on, and I shook it like a Polaroid picture. Voila! 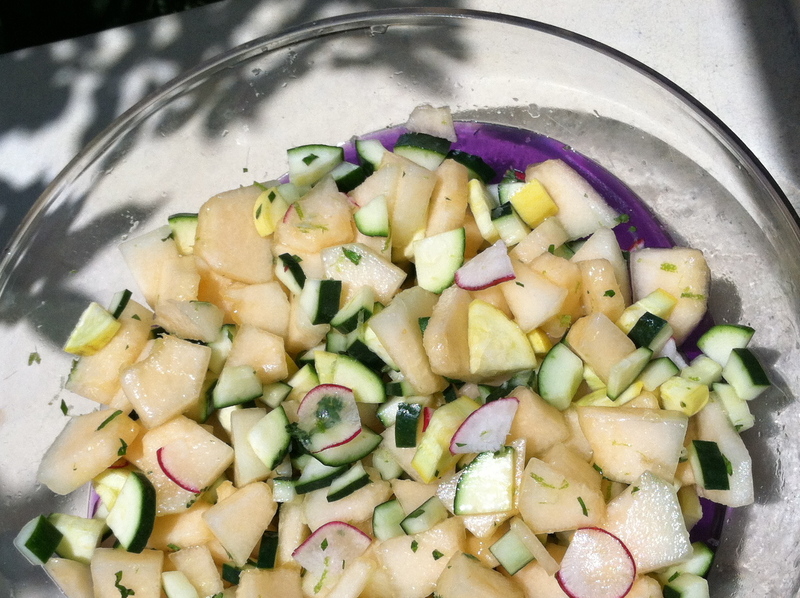 Hami and Cucumber Salad! It’s light, bright, flavorful, and really healthy. Pretty to look at, too! 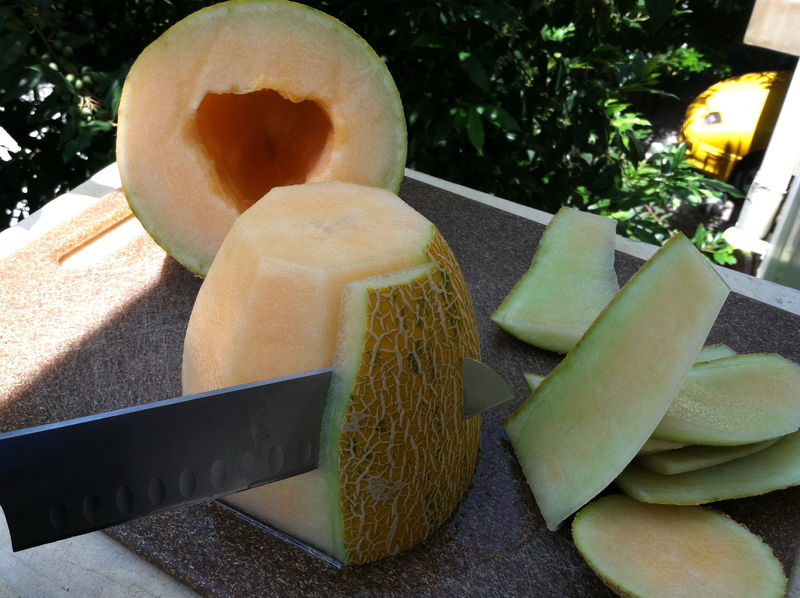 And easily made with cantaloupe if you don’t have hami melons in your neck of the woods! Give it a try – let me know what you think! This entry was posted on Thursday, July 5th, 2012 at 12:35 am and is filed under Uncategorized. You can follow any responses to this entry through the RSS 2.0 feed. You can leave a response, or trackback from your own site. You’re welcome, Janet, and thank you!